RI Sec 1 student entered top 10% band, most RI Sec 1 students achieved 4.0 or 3.6. 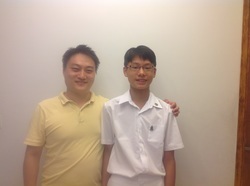 Photo with SMOPS Platinum medallist, Raffles Institute Euler's Program Student. As an experienced Mathematics specialist, Mr Jerry Guo has a strong love for mathematics and a passion in education. He is able to effectively help students foster an understanding for the common Mathematical concepts as well as master essential problem solving skills. New teaching methods developed by Mr Guo has proven to be EXTREMELY effective and has shown AMAZING results in tackling challenging topics such as Trigonometry. Mr Guo is extremely dedicated and patient, customizing the lesson plan to suit the needs of each and every student. Click here to view our specialist profile. Photo with SMO Gold medallist, RGS Raffles Academy student. Thanks to his strong Math background, Mr Jerry Guo is able to lay a solid foundation for them and guide them through the more challenging problems. Nonetheless, Mr Jerry Guo is also very patient and able to explain concepts in crystal clear ways such that the weaker students do receive great improvements too.